Then again, these could just be very bored Comcast employees. Let's face it, an FCC meeting discussing the minutiae of net neutrality is not riveting content. If you don't agree, try bringing it up at the next cocktail party you are invited to and see if you are invited back. \nThe company acknowledges it hired people to wait in line to hold spots for Comcast employees. It seems that some of these placeholders may have made it in the building as there are photos of some people sleeping through the debate. \nThen again, these could just be very bored Comcast employees. 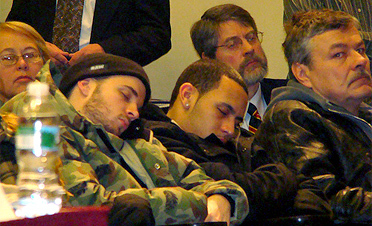 Let's face it, an FCC meeting discussing the minutiae of net neutrality is not riveting content. If you don't agree, try bringing it up at the next cocktail party you are invited to and see if you are invited back.